This is my twist on empanadas, a classic Spanish and Latin American pastry typically filled with meat, fish, cheese, or corn. Empanadas can be baked or fried, but I prefer the former (it’s more convenient, and the empanadas taste lighter.) I adapted a dough recipe from A Cozy Kitchen, swapping butter for olive oil to yield a crust that is crisp, flavorful, yet not too heavy, and prepared a simple vegetarian filling: roasted red peppers, grated Monterey jack cheese, and a pinch of ground black pepper and rep pepper flakes. The result is delicious and addictive! Prepare the dough: In a large bowl, stir together flour and salt. Mix in olive oil and water with a fork or with your hands until a dough comes together. Turn onto a floured surface and knead, coating dough with additional flour as necessary, until smooth and no longer sticky. Shape into a disc, cover in plastic wrap or place in a ziploc bag, and chill in refrigerator for at least an hour. Assemble the empanadas: Place roasted red peppers (either from a jar or homemade) and grated cheese in separate bowls. Remove dough from fridge (the oil may appear to have separated from the rest of the dough a little, but that is okay) and set aside at room temperature. When soft enough to roll out, turn dough onto floured surface, coat each side in flour, and roll until 1/8 of an inch thick. Cut out circles using a 4-inch round cutter, or turn an approximately 4-inch wide bowl upside down on the dough and trace with a knife. Roll scraps together to form additional empanadas. 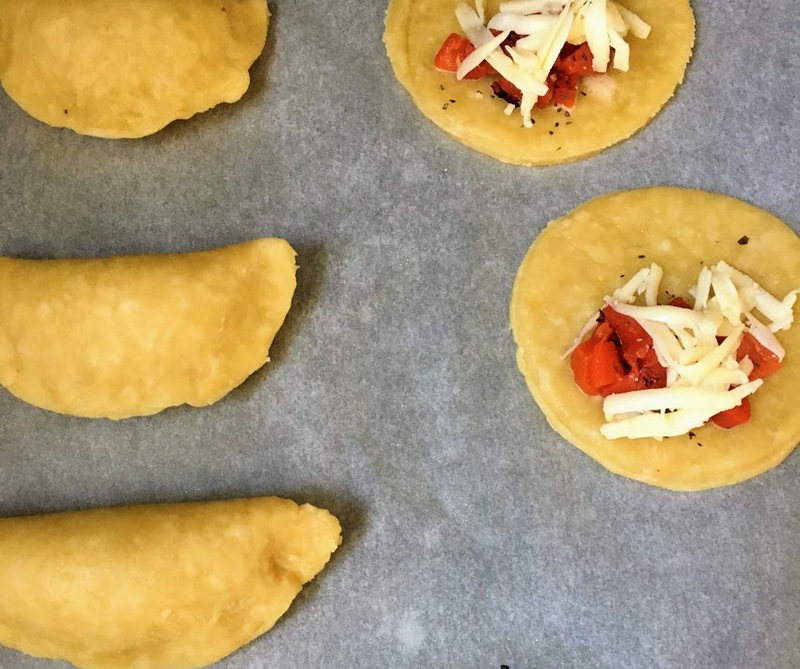 Place a small amount of cheese and peppers on one half of each circle of dough. Sprinkle on some ground black pepper and red pepper flakes. Fold the other half of dough over the filling. To seal, press the edges together with your fingers or with the tines of a fork. Place empanadas on a parchment-lined baking sheet, and put in the freezer for 15 minutes. Bake: While empanadas are in the freezer, preheat oven to 400 ºF. In a small bowl, combine water and egg. Brush the tops and sides of each empanada with egg wash. Pierce the top of each empanada with a knife so steam can be released. Bake for 25 minutes, or until golden brown and crisp. Serve right away, or let cool and serve at room temperature. To store, refrigerate in airtight container.